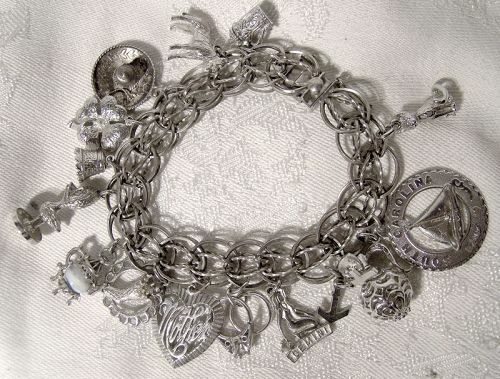 A double oval link with twist sterling silver charm bracelet with 11 charms from the 1970s. This 7-1/2" bracelet has 3/8" wide links and it is marked GB STERLING. 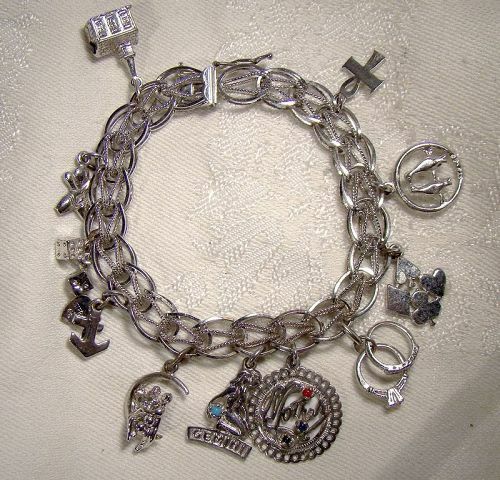 It has a box clasp with a safety loop and the charms include: church with Stanhope viewer (Lord's Prayer), bowling pins/ball, dice, heart/cross/anchor, couple sitting in moon, Gemini (with turquoise "stone"), Mother (with red, blue and green "stones"), wedding ring and band, 4 card suits, lovebirds on perch, Coptic cross (ankh), All charms are sterling silver and marked except for three charms. A Stanhope is a miniature viewer with a magnifying lens in a tube holding a celluloid or plastic image or text similar to a microfiche or microfilm. This bracelet weighs 33.7 grams and it is in excellent condition with no chips, cracks, dents, bends, corrosion, damage or repairs. This item is in excellent condition with no chips, cracks, dents, bends, corrosion, losses, damage or repairs. All items are thoroughly and conservatively graded and all condition issues are noted; all items are vintage or antique and may have slight signs of gentle use. Expedited tracked and insured parcel shipping to the U.S. starts at $19 (other spots may vary, air is higher). Items paid with a credit card will be shipped to confirmed addresses only. We do ship internationally. All of our prices are in $US. PLEASE NOTE: We DO NOT accept PayPal. 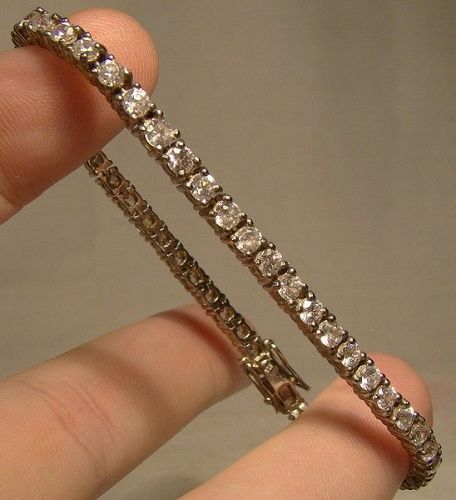 A 925 sterling silver rhinestone single row tennis bracelet from the 1970s. This flashy and elegant 7-3/8" long bracelet has individual 1/8" wide links with claw-set white rhinestones and a box clasp with two safety loops. It is marked 925 on the clasp, it weighs 11.3 grams and it is in excellent condition with no chips, cracks, dents, bends, corrosion, damage or repairs. All items are thoroughly and conservatively graded and all condition issues are noted; all items are vintage or antique and may have slight signs of gentle use. Tracked Packet shipping to anywhere in the U.S. is $14.00 - this includes online tracking, air service and insurance up to $70. Items paid with a credit card will be shipped to confirmed addresses only. We do ship internationally. All of our prices are in $US. PLEASE NOTE: We DO NOT accept PayPal. A Coro Germany silver marcasites Art Deco blue crystal pin brooch from the 1930s. 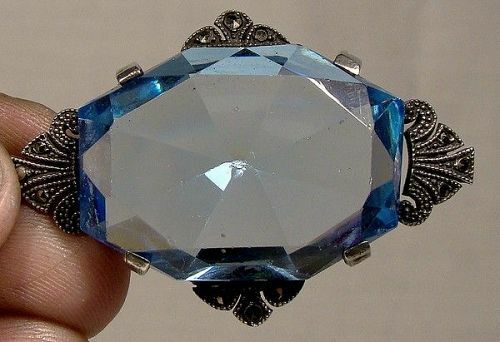 This vintage 1-3/4 x 1-1/4" pin features marcasite stones as well as a large light blue faceted crystal claw-set stone. It is marked CORO GERMANY on the back, it tests as silver and it has a safety clasp. It weighs 18.0 grams and it is in excellent condition with no chips, cracks, dents, bends, corrosion, damage or repairs other than a few very tiny edge chips and abrasions and one small pit on the table of the stone (all very minor). All items are thoroughly and conservatively graded and all condition issues are noted; all items are vintage or antique and may have slight signs of gentle use. Expedited tracked and insured parcel shipping to the U.S. starts at $19 (other spots may vary, air is higher). Items paid with a credit card will be shipped to confirmed addresses only. We do ship internationally. All of our prices are in $US. PLEASE NOTE: We DO NOT accept PayPal. 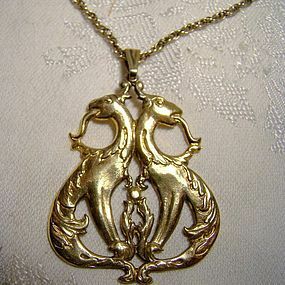 A vintage gilt sterling silver pendant necklace depicting a pair of seated and opposite facing dragons (or possibly gryphons or chimeras, not obvious) c1930s. 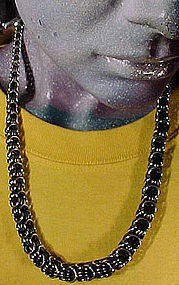 This double dragon 2-1/8" x 1-1/2" pendant is stamped only STERLING. It comes on a 22-1/2" sterling gilt or vermeil rope chain with a ball end and a spring-ring clasp (so it is adjustable as to length). It weighs 15.3 grams and it is in excellent condition with no dents, bends, corrosion, losses, damage or repairs. All items are thoroughly and conservatively graded and all condition issues are noted; all items are vintage or antique and may have slight signs of gentle use. Tracked Packet shipping to the U.S. starts at $14.50 - this includes online tracking, air service and insurance up to $75. Items paid with a credit card will be shipped to confirmed addresses only. We do ship internationally. All of our prices are in $US. PLEASE NOTE: We DO NOT accept PayPal. A sterling silver and turquoise pair of earrings circa 1930s. This 1-1/8" x 7/8" ecrewback pair of abstract design features what appears to be wings or a rayed feather and drapery style design with natural turquoise cabochons; they are marked only STERLING, they weigh 10.2 gr., and they are in excellent vintage condition with no chips, cracks, dents, bends, corrosion, losses, damage or repairs. All items are thoroughly and conservatively graded and all condition issues are noted; all items are vintage or antique and may have slight signs of gentle use as would be expected. Silver and silver plated items are hand-polished, not buffed, and our halogens and magnified images may exaggerate otherwise barely noticeable scratches and flaws. 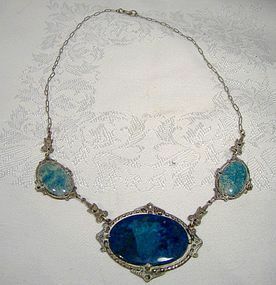 GUARANTEE: ALL of our items are antique or vintage and from the period listed. NONE are reproductions or recreations. Tracked packet insured air shipping to the U.S. starts at $13.50 US and expedited shipping within Canada starts at $9.50. Rates vary by destination, value, size, weight, payment option and shipping method. Other payment, tracking and insurance options are available - please inquire. We ship worldwide - please contact us for an accurate shipping quote with your postal code or country. **** PLEASE NOTE: We DO NOT ACCEPT PAYPAL**** PAYMENT: We accept VISA and MASTERCARD, bank drafts, bank wire transfers, and some others. Canadian buyers can also pay by Interac e-transfer. Please note that all of our prices are in US$. 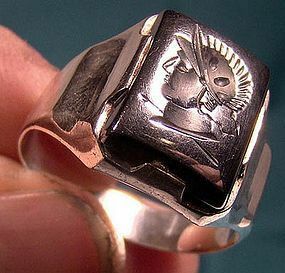 A vintage man's sterling silver ring with an intaglio carved centurion hematite or black Alaskan diamond stone c1940s-50. This size 9 ring measures 11/16" x 1/2" across the stone, it is stamped STERLING and LLM, and it weighs 10.6 grams. Intaglio simply refers to the way the stone is carved inward, rather than outward like a cameo. All items are thoroughly and conservatively graded and all condition issues are noted; all items are vintage or antique and may have slight signs of gentle use. Small packet air shipping to the U.S. starts at $9.50 (other spots may vary). Items paid with a credit card will be shipped to confirmed addresses only. We do ship internationally. All of our prices are in $US. PLEASE NOTE: We DO NOT accept PayPal. 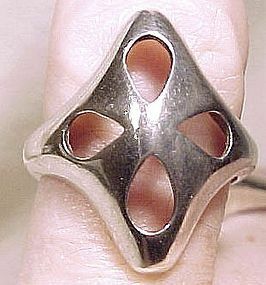 A fine vintage modernist design sterling silver ring by Hermann Siersbol of Denmark c1970. This (currently) size 6-1/2 adjustable ring measures 3/4" in length and it is heavy and well made. It is in excellent used condition with no losses, dents, monograms, corrosion, repairs or damage. It is stamped 925S and SIERSBOL. All items are thoroughly and conservatively graded and all condition issues are noted; all items are vintage or antique and may have slight signs of gentle use. Small packet air shipping to the U.S. starts at $9.50 (other spots may vary). Items paid with a credit card will be shipped to confirmed addresses only. We do ship internationally. All of our prices are in $US. PLEASE NOTE: We DO NOT accept PayPal. An attractive vintage c1950 sterling silver and marquisites size 6-1/2 ring in the form of a bow or pleated napkin. 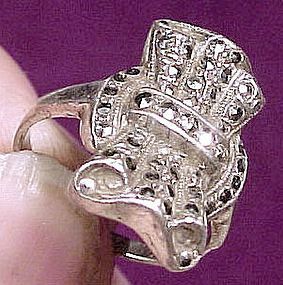 This ring weighs 4.6 grams, it measures 3/4 x 9/16" across the design, and it is marked STERLING WEST GERMANY and it is in excellent original condition with no chips, cracks, dents, bends, corrosion, losses, damage or repairs. All items are thoroughly and conservatively graded and all condition issues are noted; all items are vintage or antique and may have slight signs of gentle use. Small packet air shipping to the U.S. starts at $9.50 (other spots may vary). Items paid with a credit card will be shipped to confirmed addresses only. We do ship internationally. All of our prices are in $US. PLEASE NOTE: We DO NOT accept PayPal. 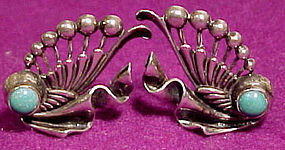 A fine wreath-style pin and matching earrings in sterling silver with cultured pearls 1950. This set consists of the 1-5/8" pin and the 7/8" screwback earrings. The pearls average 4.5 mm. in size, and the pieces are marked SK SILVER; they are probably Japanese. This set is in very good original condition with no cracks, scrapes, dents, monograms, bends, corrosion, damage or repairs other than the loss of one outer leaf on the pin and on one earring. All items are thoroughly and conservatively graded and all condition issues are noted; all items are vintage or antique and may have slight signs of gentle use. Tracked Packet shipping to the U.S. starts at $16.50 - this includes online tracking, air service and insurance up to $100. Items paid with a credit card will be shipped to confirmed addresses only. We do ship internationally. All of our prices are in $US. PLEASE NOTE: We DO NOT accept PayPal. A silver marcasites chariot & goats shell cameo pin brooch from 1900 1920. This unusual and beautiful vintage .800 silver filigree mounted shell cameo brooch has a barrel or trombone clasp, the setting is stamped with two marks that are difficult to make out as well as ITALY 800, and the hand carved shell cameo depicts a winged putto or angel figure in a chariot being pulled by two rearing goats (as they are wont to do...). The carving is fine and detailed and undoubtedly the work of a talented artisan, although, as is often the case, there is no signature on the back. The marcasites shine brightly and this 1-1/2" x 1-3/4" cameo is in excellent condition, with no chips, cracks, wear, repairs or damage. All items are thoroughly and conservatively graded and all condition issues are noted; all items are vintage or antique and may have slight signs of gentle use. Expedited tracked and insured parcel shipping to the U.S. starts at $23 (other spots may vary, air is higher). Items paid with a credit card will be shipped to confirmed addresses only. We do ship internationally. All of our prices are in $US. PLEASE NOTE: We DO NOT accept PayPal. 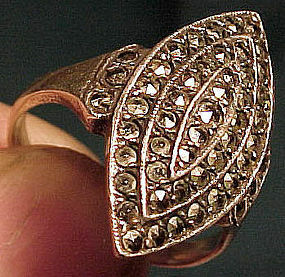 An attractive marquise-shaped marquisite sterling Art Deco ring c1920-30. This size 6-1/2 ring measures 15/16 x 9/16" across the top and it weighs 5.5 grams. It is stamped SILVER, and it is in excellent original condition with no chips, cracks, dents, bends, corrosion, losses, damage or repairs. All items are thoroughly and conservatively graded and all condition issues are noted; all items are vintage or antique and may have slight signs of gentle use. Tracked Packet shipping to the U.S. starts at $16.50 - this includes online tracking, air service and insurance up to $100. Items paid with a credit card will be shipped to confirmed addresses only. We do ship internationally. All of our prices are in $US. PLEASE NOTE: We DO NOT accept PayPal, only VISA and MASTERCARD. A vintage 1920s-30s Art Deco 1-1/4 x 5/8" silver pendant and 34-1/2" silver chain with springring catch. The pendant is stamped HB STE and it has a teardrop shaped black celluloid stone topped with a silve leaf with marquisites. 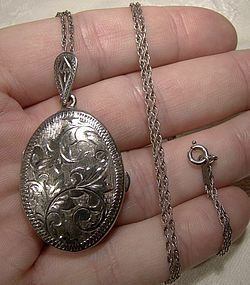 The chain ends in a springring catch which joins with the pendant's loop; it is stamped ECCO STERLING on the loop. This item weighs 7.1 grams and it is in excellent original condition with no chips, cracks, dents, bends, corrosion, losses, damage or repairs other than some minor scratching from rotation of the leaf insert on the celluloid. All items are thoroughly and conservatively graded and all condition issues are noted; all items are vintage or antique and may have slight signs of gentle use. Tracked Packet shipping to the U.S. starts at $16.50 - this includes online tracking, air service and insurance up to $100. Items paid with a credit card will be shipped to confirmed addresses only. We do ship internationally. All of our prices are in $US. PLEASE NOTE: We DO NOT accept PayPal, only VISA and MASTERCARD. A well designed and beautifully finished 21-3/4" long .835 silver necklace, with a repeating design of graduated interlocking silver loops. It is constructed from a group of four silver loops encircling the next four, and so on; the loops range from 3/16" to 7/16" across. This beauty is stamped .835 and it has a maker's mark (unidentified). It has a spring-ring catch, and it weighs 57 grams. It would look great with almost any style of clothing - a classic. It is in excellent original condition with no dents, bends, corrosion, losses, damage or repairs. All items are thoroughly and conservatively graded and all condition issues are noted; all items are vintage or antique and may have slight signs of gentle use. Tracked Packet shipping to the U.S. starts at $16.50 - this includes online tracking, air service and insurance up to $100. Items paid with a credit card will be shipped to confirmed addresses only. We do ship internationally. All of our prices are in $US. PLEASE NOTE: We DO NOT accept PayPal, only VISA and MASTERCARD. 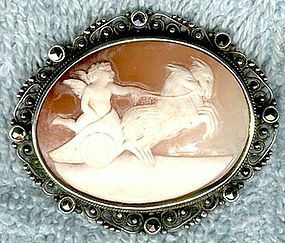 An Edwardian pink coral cameo sterling marcasite pin circa 1900. This stylish 2-1/4" pin features two large marcasites flanking a 3/4" x 3/8" carved light pink coral portrait cameo, which has a subtle pink blush. 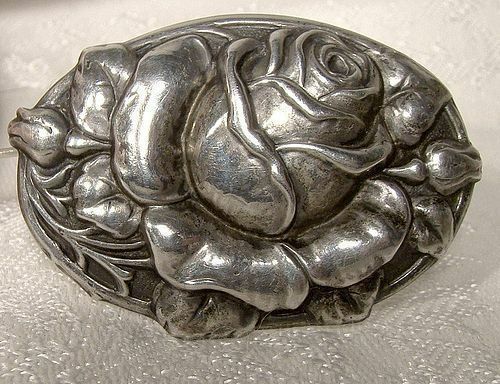 It is marked STERLING SILVER, and it is in excellent original condition with no chips, cracks, dents, monograms, bends, corrosion, losses, damage or repairs. All items are thoroughly and conservatively graded and all condition issues are noted; all items are vintage or antique and may have slight signs of gentle use. Tracked Packet shipping to anywhere in the U.S. is $14.00 - this includes online tracking, air service and insurance up to $70. Items paid with a credit card will be shipped to confirmed addresses only. We do ship internationally. All of our prices are in $US. PLEASE NOTE: We DO NOT accept PayPal.